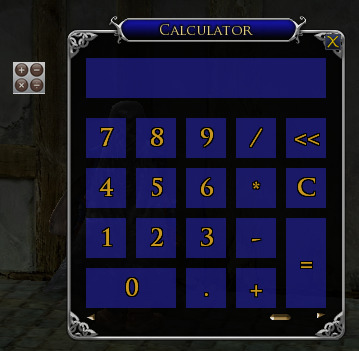 This is a basic calculator that you can use in game. Do you play in Full Screen mode and get tired of alt-tabbing to add the amount of materials you need? I do! I'm sure there are more uses, feel free to find them. The original package came from Willby's Calculator. The math portion was good and virtually untouched, but the GUI has been modified for easier use. Button Icon to show or hide the calculator for easy use. I highly recommend just using the Lotro Plugin Compendium LunarWtr has made it simple to download/install/and update plugins that have added support for the tool. You'll find InCalc there. If you choose not to use LPC...Download the .zip file and extract the files so you have the folder with the following DavsPlugins/InCalc. Place that folder into the Lotro plugins folder. The default location is C:\Users\YOURNAME\Documents\The Lord of the Rings Online\Plugins Once you put the folder there, you should be ready to start calculating away in game. If you find any problems, please report them below and I will do what I can to correct them in a timely manner. Enjoy! What OS are you running and what are the errors you are getting. I've installed it recently and had no issues. ...Rings Online\Plugins\DavsPlugins\InCalc\__init__.lua:12: Failed to import package "DavsPlugins.InCalc.Utils.DavsUtils". ...the Rings Online\Plugins\DavsPlugins\InCalc\Main.lua:6: Failed to import package "DavsPlugins.InCalc". Last edited by Tangaar : 10-28-2017 at 03:24 PM. It requires the standard supplemental library from Turbine. You can either download it directly, or use Plugin Compendium and select the "Turbine Examples". The issue is that it is possible to leave the icon without firing the MouseMove event. If the user hovers the mouse over the very edge of the icon, the tooltip will be displayed, then if the user moves off the icon, the MouseMove event isn't fired because the mouse isn't moving over the icon, rather it is leaving the icon. You can avoid this by putting the code that hides the tool tip into the MouseLeave event instead of at the end of the MouseMove event since the MouseLeave event will always fire, even if the mouse was just on the edge of the icon. Great thanks I will work on updating this! Hmmm, I haven't experienced that problem. It should go away as soon as you move the mouse. At least that's what I have programmed in the script. Thanks for a very nice plugin. But once the icon tooltip has been shown it doesn't seem to want to go away. Shouldn't moving the mouse away from the icon remove the tooltip? Uploaded new file today! Sorry for the delay. This should fix it. I don't know why I keep having zip file issues. Re: InCalc not showing installed. I tried using the LOTRO Plugin Compendium to install your plugin and it downloaded to the correct folder, but I don't think it installed. It doesn't show in the "installed plugins" tab on the Plugin Compendium, nor does it refresh or show as a plugin using the in game plugins manager. Thank you for improving on this helpful little plug in. It looks like the latest release of this plugin is missing its parent folder "DavsPlugins". Ok, I think I have all the bugs worked out with the upload system. Enjoy! I know I have been. Last edited by Davinna : 02-12-2013 at 01:56 PM. I have a new version to be compatible with LPC, but I'm trying to understand how to get it as the main download. v1.1 is currently listed as an addon.